Board-certified physicians are available 24 hours a day, 7 days a week, by phone or online secure video. 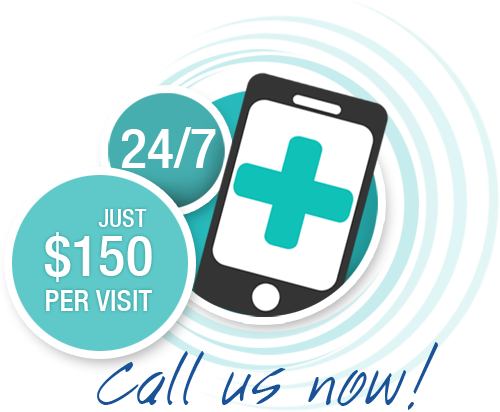 With recent advances in online and digital video technology, online urgent care from Telemedicine Physician Group is more accessible, practical, and affordable than ever before. Telemedicine allows patients to consult doctors for a wide variety of concerns in the comfort and convenience of their own home, office, or hotel room. If you want a quick diagnosis or prescription without the hassle of making an appointment or waiting in a congested emergency room, consider contacting a board-certified online doctor at Telemedicine Physician Group. Not only is telemedicine convenient, it’s incredibly affordable too. Although our physicians are as experienced and knowledgeable as any doctor out there, our lack of a physical office allows us to keep costs incredibly low, and we pass the savings onto the patient. Each consultation with a board-certified telemedicine physician is only $150, far cheaper than the deductible many have to pay when visiting an emergency room. According to the American Medical Association, around 70 percent of all visits to the doctor are made simply to exchange information between doctor and patient, or to receive a prescription. Not only are visits to a physical doctor’s office always more expensive, but they are almost always unnecessary. A Telemedicine Physician Gives You Quality Care When You Need It! The idea of an on-call doctor is nothing new in the health care industry, but with telemedicine, there is no red-tape, hospital administration, or physical distance to get in the way of you receiving quality care. You simply call up an experienced telemedicine physician, talk with him or her about your symptoms and medical history, and receive a diagnosis or prescription. Payment is handled over the phone or video call or you don’t have to worry about dealing with pesky follow up calls down the line. The only follow up you will receive is one from your online doctor checking up on how you are doing several days after the appointment. Although our doctors are not physically in the room with you, they provide the same level of warm care and comfort that you’d expect from your neighborhood family physician. Our doctors are also trained and certified at a level far exceeding what would be expected of a normal physician. All of our physicians have been verified by both the American Medical Association and the National Physician’s Database, and they are required to be credentialed every three years under the standards of the National Committee for Quality Assurance. Affordable, Quality Health Care for All! Telehealth is being recognized more and more everyday as the future of quality, affordable health care. Prior to telecare, getting healthcare on an on-demand, when you need it basis was financially out of reach for anyone without healthcare. Now, uninsured or underinsured patients who have access to a phone or webcam can feel comforted in their ability to see a doctor when they need one without breaking the bank. Using a telemedicine physicians also provides amazing health-care opportunities for anyone travelling or living in rural and remote areas. Before telecare, being in an unfamiliar area or somewhere familiar but miles from hospital would make people disregard their need for urgent care. Often, failing to see a doctor will only lead to more serious health problems that could have been easily prevented with a call to Telemedicine Physician Group. With Telemedicine Physician Group, the path to a clean bill of health is only a phone call away.